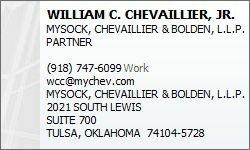 William C. Chevaillier, Jr. - Mysock, Chevaillier & Bolden, L.L.P. has been practicing in Tulsa Oklahoma for over 35 years. Mr. Chevaillier represents individuals, corporations, partnerships and other entities in all areas of federal, state and local taxation. He offers planning services for clients who wish to minimize potential income and estate tax consequences by utilizing the latest and most innovative techniques. He has assisted numerous clients against the Internal Revenue Service regarding proposed tax assessments and collections, including representation throughout the administrative appeals process and trial of tax matters in federal district court and before the U. S. Tax Court. He has represented a significant number of individuals and companies in mergers and acquisitions. Because Mr. Chevaillier is also a licensed certified public accountant, he offers accounting and tax compliance services in addition to his legal expertise. Mr. Chevaillier has taught numerous seminars in all areas of taxation, estate planning and asset protection.